An impromptu shopping expedition to the Japan sims was undertaken (seriously, they’re given names like JAPAN 01, JAPAN 02, JAPAN 10) and I was not disappointed. Stores I’d never heard of before, such as :sey, -=about=-, and Chase all yielded some fun finds. What made it even more fun for me was the fact that a lot of these clothes will work on girl avis, too. All right, enough of my jibba-jabba. Let’s see some pics of Machete’s new duds. ^_^ Clicking on the images will take you to their respective flickr pages where you can view larger versions. SLURLs and credit info are at the end of this post. Machete picked up this black jacket at a store called Chase. There are actually two versions of the jacket included in the folder: one with a white undershirt showing at the neckline, and one that has just the jacket itself so that you can layer another shirt underneath. Prim attachments at the wrists and at the collar finish the look nicely, and the prim attachment at the collar also has some flexi-prim parts that add some realism to the jacket. Machete also grabbed this triple hook pendant. I’m normally not a very big fan of these choker type cord necklaces in SL because I don’t care much for the way they float around the neck, but it works with this jacket since the prim collar masks the whole suspended-in-air thing that’s going on. Another fantastic find: a store that’s simply called “-=about=-“. Machete bought the black suit set there and I loved it so much, I had to get it for myself. The designer at -=about=- obviously understands that people like me are fond of mixing and matching their clothes, because a lot of what’s sold in this store is loaded with layering options. Take the black suit pictured above, for example: you can choose to wear the shirt tucked or untucked, under a jacket or by itself, and with or without the necktie since the tie is actually a prim attachment. You can also choose to wear a different shirt underneath because the suit jacket is also provided on the jacket layer sans white shirt, but please note that I did find two small white markings on the sternum area where alpha is used (see the left portion of the image above); wearing a white or a very light-colored item with the jacket seems to render the markings virtually invisible but they are there. As you can see, the suit works just great on a female avatar. 😀 While a lot of this is owing to the way system layer clothing is applied to our avis, the lack of strong pectoral shading and definition helps. (Guys who deliberately choose to have a “normal” avatar that isn’t ripped, cut, and chiseled to so-called muscled perfection will also appreciate this, I think.) To help soften the masculine feel of the suit, I chose to wear a skin that comes with dramatic smoky eye makeup and red lips, prim lashes, red nail enamel, and an ultra-feminine hairstyle that is long and wavy. In this next picture, Machete is wearing the military jacket and denim jeans also from -=about=-. This jacket is what really made me consider buying the men’s clothing at -=about=- for myself in the first place. The olive green texture is incredibly detailed and has that faded, ultra-comfortable look that immediately makes you think it’s someone’s favorite and oft-worn jacket. Denim items that feature torn and frayed details work well with this weathered look. -=about=- also sells a shirt set which, imo, gives a thorough offering of layering options that really ought to be the SL standard by now for both men’s and women’s clothing. The shirt set features a t-shirt that you can choose to wear either tucked or untucked, with or without the plaid print overshirt, and it’s up to you if you’d like for the overshirt to have long sleeves or rolled up sleeves. 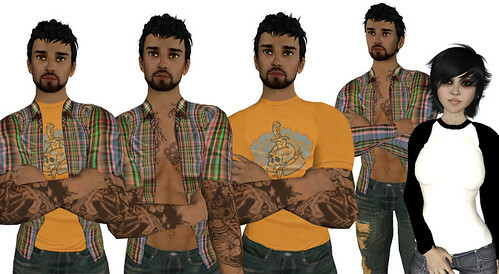 Hell, you can even wear the overshirt by itself to show off those nice tattoos you’ve got on your chest :p , or layered over another shirt from your virtual closet (provided that it comes with an underpants layer, but that’s not something I see very many menswear designers offering). This next picture shows jackets that come from :sey. Machete had actually stumbled across :sey in the Japan10 sim, but risey Arai’s landmarks all point to his main store in the Honmoku sim. :sey offers a good variety of jackets and coats, and the first thing you’ll notice about them is the detailed primwork with which they are adorned. Tiny prims, flexi-prims, sculpty prims — these jackets have got it all. If you’re not afraid of primmy clothing and you appreciate attention to detail, then these are worth checking out. Machete is wearing the Riders Jacket in gold/brown. The word “gold” in the description refers to the metal used for this jacket; risey also sells a version of the jacket that uses silver metal. Nice to have that kind of choice, huh! The jacket comes with a double belt that sports lots of studs, grommets and buckles. This theme of lots of small metal pieces is repeated at the collar and sleeve cuff prims, and is offset by a mixing of different leathers (patent and suede). When you make the purchase, you are given both the male and female jackets, so there’s no need to worry about accidentally buying the incorrect gender version. The jacket I’m wearing was simply named “leather jacket”. I chose red but it’s offered in all sorts of colors, and you can choose to purchase it either by itself or as part of a jacket and pants set. 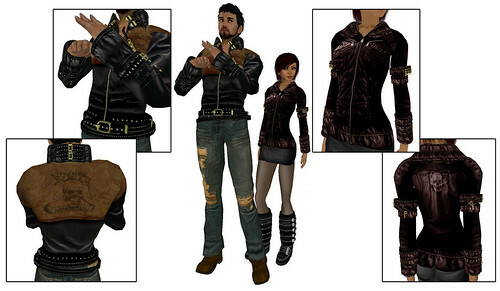 The leather texture on this jacket has a great glossy look to it and the winged skull on the back is a cool detail. 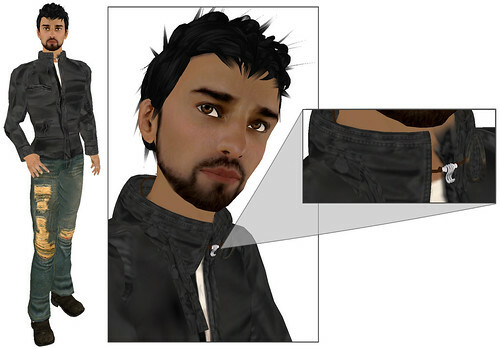 This unisex jacket comes with even more prim attachments than the Riders Jacket, with a collar prim, sleeve cuff prims, and a pair of prims that circle the upper arms. Lots of metal is featured on this jacket as well, but in a less prominent manner; the metal pieces are generally smaller than the ones you’ll find on the Riders Jacket. The metals appear as both prims and as part of the textures; I especially liked the decorative zipper sliders on the upper arm attachments. All told, I had a lot of fun looking at men’s clothing for my avi. There’s more goodies that I got at :sey that I’ll be blogging later; I’m going to have to start paying more attention to menswear from now on!